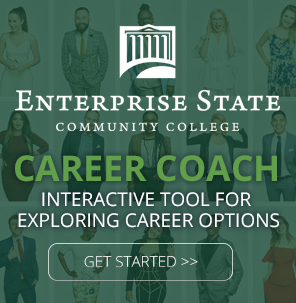 Enterprise State Community College strives to make the admissions process as streamlined and hassle-free as possible for our first-time, transfer, readmission, and transient students. ESCC is committed to providing quality education opportunities to people from all walks of life; so whether you’re a high school graduate, GED holder, high school student seeking dual enrollment or a transfer or returning student, we welcome you to our campus. Submit an application – Pick up an application from our campus or access one online, then fill it out and submit it in mail, in person or via the Internet. You’ll also need to complete a residency form. Submit a photo ID – You’ll need to provide a notarized copy of an unexpired driver’s license or make a copy of your license in our admissions office. If you don’t have a driver’s license, you’ll need to supply two other forms of ID, one of which must be a photo ID. Submit an identity verification form: Obtain one of these forms from our admissions office or online, complete and submit it. Further admissions requirements may be necessary for certain students. International students must submit an international student application, official transcripts, an I-20 Form, TOEFL scores, declaration of responsibility statement, proof of insurance and other relevant forms no later than a month before the semester they are applying for begins. Previous ESCC students or students who applied but never enrolled must complete a readmission form. These forms are available online or at our campuses. Students transferring from another college or university will need to submit a general application for admission, as well as official transcripts from their previous college or university. Students enrolled at other institutions who wish to take courses at ESCC that will transfer back to their home college or university will need to fill out a general admission application and an official transient form from their current college or university, which will ensure the credits earned at ESCC will transfer to the student’s home institution. High school sophomores who have a cumulative “B” average and the permission of their principal may enroll at ESCC as accelerated high school students. These students must meet ESCC entrance requirements and may only enroll in courses whose prerequisites they meet. These students only earn high school credit for their ESCC coursework. This program allows high school students to earn high school and college credit for ESCC coursework. Students must be in at least grade 10 and have a cumulative 3.0 GPA for academic programs or a cumulative 2.5 GPA for career technical programs. They must also have the permission of their principal and school system superintendent.